Flexflooring are one of the UK’s leading suppliers of Epoxy and Polyurethane flooring. Their target audience is to serve both the B2B and B2C sectors, from homeowners looking for large resin driveways to Audi car showrooms and playgrounds at ‘Peppa Pig World.’ Flexflooring have a versatile set of products that are specified by architects and contractors as well as used for one off domestic projects. 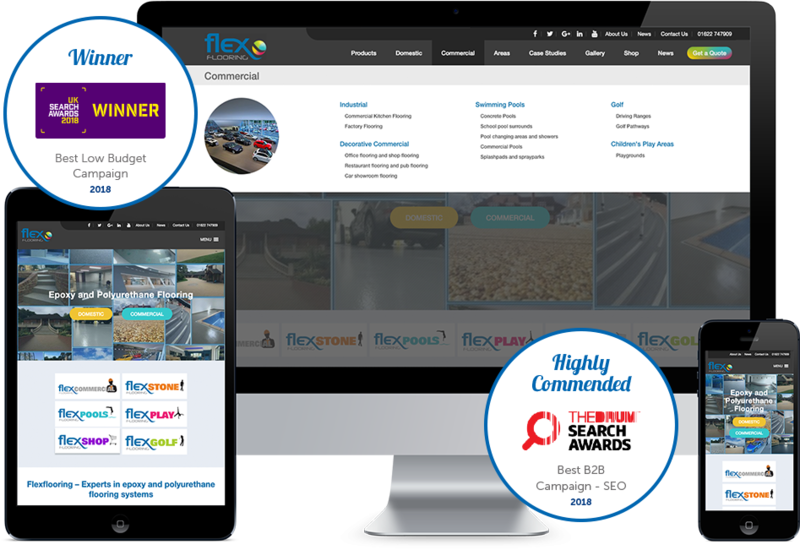 Flexflooring had invested in SEO before engaging with Reflect Digital but had not seen a significant increase in traffic and enquiries. Flexflooring did have some SEO visibility but there was still a lot of untapped potential to increase their visibility further and generate more business from search engines. We were tasked with taking over the SEO and development of their WordPress website to identify opportunities to generate more visibility and in turn, a higher number of leads and sales. Grow site traffic by researching, writing and publishing landing pages for each area / space that they install flooring for to rank well in search engines. Make sure the site content had a clear user journey in which the user can find the correct product and make an enquiry with minimum friction. Position Flexflooring as an authority within their industry by providing informative content around their subject area. Increase the number of new enquiries generated through the website. Domestic (B2C)- Supplying primarily resin driveways, swimming pool surrounds and flooring for the home. Commercial (B2B)- Supplying architects, contractors, schools, leisure centres, retail outfits warehouses etc. Our challenge was to ensure that regardless of whether the customer was B2B or B2C, they can quickly find the content that speaks to their individual needs. From this, they can navigate to the products they need and easily make an enquiry. We carried out in-depth keyword research to identify both short tail and long tail content. We needed to recognise the phrases their customers were searching for, e.g. ‘resin bound driveways’ and ‘industrial epoxy flooring.’ With regards to the long tail keywords, we noticed that many were searching for ‘resin driveway cost,’ showing that there was a need for informative content around their product offering to answer these questions. It was difficult for users to navigate to the pages they needed to with the existing navigation. We designed and developed a new website navigation for users to quickly find content they need regardless of where they are on the website. This also enabled us to create new landing pages with optimised content for each ‘area and space’ that Flexflooring installed. We carried out in-depth keyword research to identify both short and long tail content that was required. CRO work was carried out in order to increase enquiries from the beginning of the campaign and ensure maximum value was achieved from increased traffic. We designed and developed a new website navigation for users to quickly find content they need regardless of where they are on the website. Technical optimisation was implemented to improve site speed, clean up crawl errors and appropriate Schema markup was added. In order to maximise long tail traffic we analysed the SERPs to identify high search volume phrases that had the potential to trigger a position zero listing i.e. 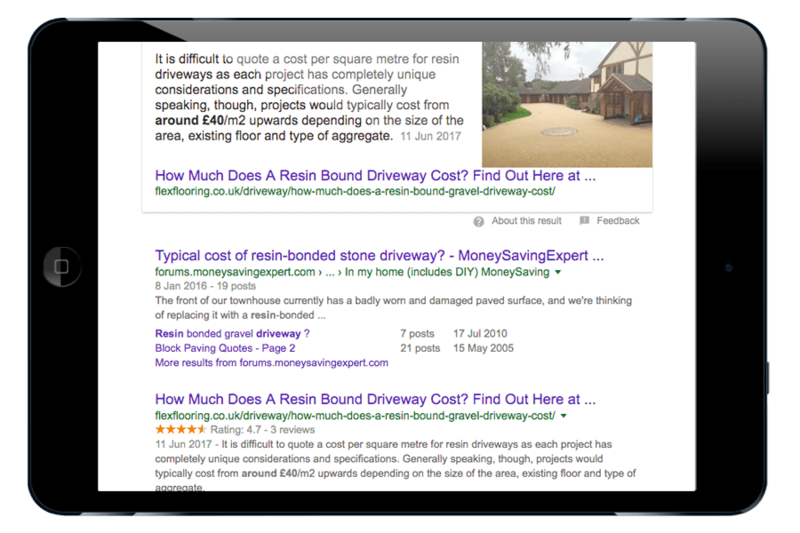 ‘resin driveway cost.’ This presented a unique opportunity to provide informative content around their product offering to answer a question that the user has, positioning Flexflooring as an industry leader and in turn generating leads. This position zero strategy also enabled us to tap into competitive keyword groups, without having to compete for short tail phrases that are highly competitive and dominated by the competition. 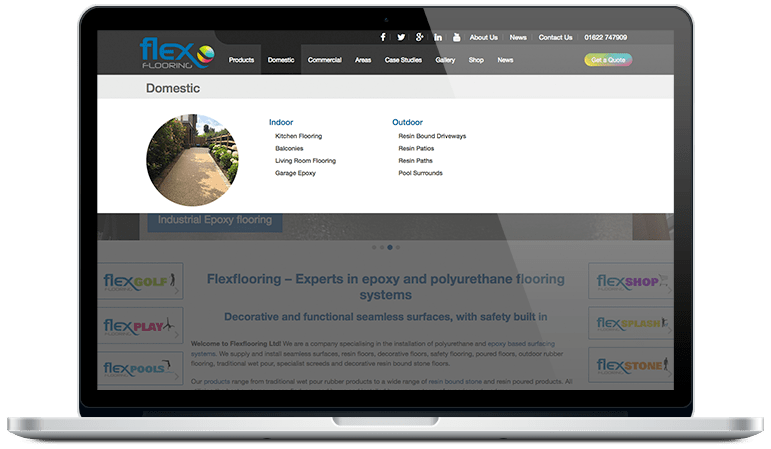 Once featured listings where achieved we also optimised this content further to encourage users to click through to the content and find out more about what Flexflooring could offer. For any forms of marketing, tracking is vital to understanding performance and continually improving campaigns. No enquiry or engagment tracking existed on the website at the start of the campaign so this was immediately implemented so that we can understand where enquiries are coming from and how users are engaging with the website. This has allowed us to carry out conversion rate optimisation work for greater enquiry levels. 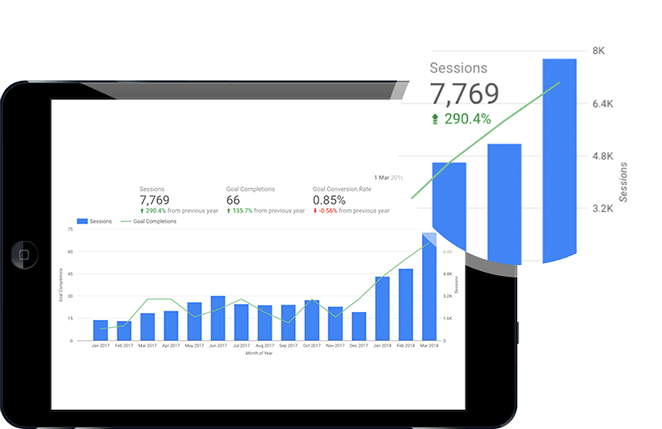 Through the landing page content optimisation and new navigation strategy, traffic from search engines has quadrupled year on year with a 309% increase after just 18 months. We have achieved consecutive record months of SEO traffic as the site consistently outperforms the previous year. We changed the content on the 'resin drive cost' page and have achieved a position zero featured answer result. We replicated the position zero strategy across several of the ‘cost enquiry’ questions related to the flooring that FlexFlooring provide. These new pages also achieved strong ranking positions which in total, generated a significant 327% year on year increase in enquiries when comparing January 2017 to January 2018. Over the course of the year, Flexflooring has recorded a larger percentage of leads from ‘new business’ (generated from the website) and has experienced less reliance on existing business. Flexflooring had also reported that the first quarter of 2018 was a record quarter for revenue as they had recorded a 21.8% increase from the previous year.